Former NSA contractor Edward Snowden said that US government needs to realize that spying hurts US tech companies financially. The U.S. National Security Agency needs to consider the repercussions of its spying on electronic communications and data, especially how that impacts U.S. economic interests, former NSA analyst Edward Snowden said today. "There's a big question on if the potential intelligence we gain is worth the effort. They're reducing the trust of the security in American products. This is critical in American industry. 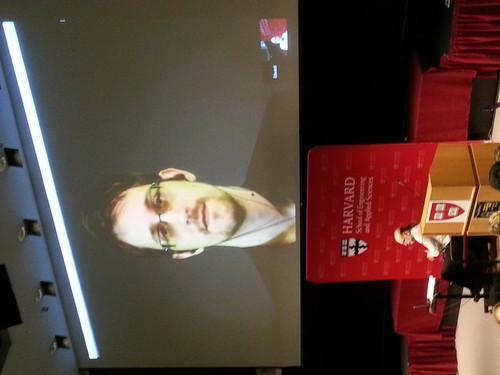 It has a real cost, not just moral but financially," said Snowden, speaking Friday via video at a Harvard University conference on privacy in a networked society. He also said the NSA must understand that the methods it employs to secretly collect data can also be used against the U.S.
Snowden made international headlines in 2013 after releasing classified U.S. government documents that detailed the NSA's extensive spying programs. Some of those documents, which are still being released, showed that the NSA placed or attempted to insert back doors in hardware, software and Web services from U.S. tech companies. This discourages potential customers and has cost the U.S. at least US$35 billion, said Snowden, citing studies. Snowden now resides in Russia after the country granted him a three-year residency permit in 2014, as he expects to be prosecuted for his disclosures by the U.S. Using encryption is still the best way to keep data private, said Snowden. The leaked documents show that the NSA still struggles to break encryption programs like PGP and Tor. Instead of trying to crack encrypted data, the NSA looks for other ways to obtain the information. "When they do attack, it is through a weakness. The wall is high so rather than go over it, they want to go around it or under it," Snowden said. Exploiting a weak point, like a zero-day vulnerability, is one way that the NSA gets around encryption. With many governments, companies and people using the same technology, the same exploit that the U.S. government uses can also be used by another entity to attack the U.S. And while both countries may use the same exploit, the value of the data they acquire varies tremendously, he said. Snowden offered the example of North Korea, whose government computer systems the NSA has been able to hack since 2010. Despite having this access, the U.S. missed information on missile launches, leadership changes and a recent hack that targeted Sony. The massive attack, which exposed sensitive information from the company's entertainment division, allegedly came from the reclusive, Communist nation. The U.S. gained very little information while North Korea was able to attack core U.S. beliefs. "If we have a weak end point and they hack us once, it doesn't matter if we hacked them 10 times. If they hack us once, because they have that one common standard, they're far, far ahead. With Sony, everyone in the country is saying that they are attacking our basic values. It was so much [more] valuable for them than for us," he said. As for who the NSA hires to carry out its hacks, they're not "mystical hacker steroid guys. A great portion of them are junior enlisted military guys," Snowden said, adding that their training isn't exceptional. This explains why the NSA publishes detailed guides on how its staff obtains information. "They have so many stop conditions in case somebody gets a little foggy and leaves something behind. There's risk aversion in how personnel are managed," he said. Active data collection operations like the ones used by the NSA run the risk "of something following you home," Snowden said, adding that the NSA routes some of its attacks through other countries to avoid detection. "When you're participating in this environment, a culture of impunity develops. They're not bad people at the NSA. They go 'I can do this because it's for a just cause,'" he said. Some positive developments have emerged since the NSA documents became public. The U.S. government now works with tech companies on legally obtaining user data instead of acquiring it through questionable methods. "[Tech companies] said 'Yes, we'll cooperate but you can't just do what you've been doing and hack in through the back door,'" said Snowden. And the government's criteria for determining if an NSA program should be carried out has changed. "The president has said that the way they go around authorizing the program has changed. Just because we can do it doesn't mean we should do it," he said. Still, even with these improvements any data requests from the spy agency should be met with a healthy amount of skepticism. "If the NSA is knocking on your door and it is not a compelled basis, like a court order, you should ask yourself why. Am I benefitting the country, the public, or a group of spies," Snowden said.